If you sign a new contract at the end of summer, you’re most likely going to be on assignment during holidays. It’s important for everyone that enjoys the holidays to plan their vacation time, but it’s pertinent for travelers to plan ahead for time off. Due to the nature of the job, it’s often more difficult for those traveling healthcare professionals to take off days without a lot of prior notice and even then it’s never a guarantee. So we’re here to help you plan ahead and show you how to enjoy the holiday season even if you’re on assignment. Traveling healthcare professionals love the flexibility of their job. It’s one of the most bragged about parts of the traveling medical pro’s life. Travelers are able to go to destinations that excite them and experience different cultures in ways that most don’t ever get to experience. Find a location that interests you – Go somewhere that excites you! Think about the climate during the winter months – Would you like to be in the snowy mountains or in sunny California? Consider assignments that aren’t far from home – You can always drive back on a day off! Research events – Are you the type that loves the holidays? Find an assignment location that decorates the entire town or hosts annual holiday parades and events. Ask your recruiter about shorter assignments – Sometimes there are shorter, 4 to 6 week contracts available that will ensure you are off before the holidays are over. Traveler’s Ask: Do I have to work all major holidays? An important question that most travelers have is whether or not they have to work all major holidays, and the answer is: no! Of course, there are some assignments that will have specific holidays required within the contract, but your travel recruiter will make you aware of that situation before you move forward with the interview. Keep in mind that every hospital, healthcare facility, etc. is going to have different requirements for their staff and travelers. When you are speaking to your recruiter it’s important to ask these questions to ensure you understand exactly what’s expected of you. So for example, let’s say you are considering a contract with CHI Health. The contract requires that the traveler be available to work 2 of the 3 major holidays. However, when you read the contract from a specific CHI Health hospital, you notice that the traveler will need to work all 3 major holidays. It can vary from facility to facility, so always ask your recruiter prior to signing as well as discuss specifics during an interview to find out exactly what the facility policy is. Generally speaking, it’s common for facilities to ask that travelers be available for 2 of the 3 major holidays (Thanksgiving, Christmas and New Years Day). While being interviewed, the hiring manager will usually ask you which holiday you would like to have off. This is great because the request can be added into your contract meaning you will most likely receive that day off and also give you time to plan ahead. If you aren’t asked which holidays you would like to take off during the interview, just simply ask about their request policy at that time. Too often we notice that hospitals prefer to give their staff nurses first choice at choosing which holidays they prefer off. This way, they can have travelers work the holidays with the most need. Again this is why it’s always important to ask what the policy is, especially if the holidays are important to you. It’s possible for travelers to request off all of the holidays during an assignment. There are some travelers who always take assignments over the holiday season, but never actually work a holiday. If you are requesting this, which you can, it will limit the number of assignments available. Of course, if the holidays are important to you, this is also an option. So when your looking for the perfect assignment over the holidays, be sure to keep our suggestions in mind and always be upfront with your recruiter about time off. 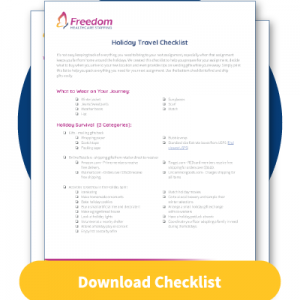 If you’re headed to a new assignment soon or need help getting into the holiday spirit in your new location, download our Holiday Traveler Checklist! It’s sure to get you in the spirit (and keep your packing organized too).